You wait years for a Captain Marvel movie and then two come along at once! Both of which star Djimon Hounsou! Yes, I know, I know. 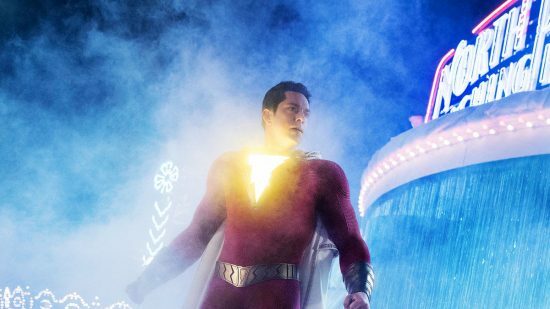 DC’s Captain Marvel has reverted back to being called Shazam! but those of us who read the comics know what I am talking about. That’s something for a whole other article. Instead, let us get back on track and talk about the Big Red Cheese, Shazam! For those long-time readers, you will know that I have not been impressed with the majority of the DC / Warner Bros. superhero movies. They’ve been too dark, bleak, confusing and haven’t got the characters quite right. They all seemed to be embarrassed to be associated with the fact they were comic book characters. Wonder Woman was a step in the right direction, but still had its problems. Aquaman was a glorious mess that revelled in the ridiculousness of the concept and had colourful moments of pure comic book wonderment. Then along came Shazam! and it seems that DC and Warner Bros. have finally remembered why kids like comic books. They are filled with wonder, joy, moments of peril, cool action, funny dialogue and crazy villains. Shazam! takes all of that and wraps it up in an 80s style adventure movie with modern day effects. It captures the magic of comic books. For those of you who don’t know the concept, Shazam! sees a 14-year-old boy called Billy Batson (Asher Angel) get taken in by a new foster family. Billy ends up being given the powers of Shazam! (played by Zachary Levi) which sees him transformed into one of the most powerful superheroes in the DC Universe. Basically, it is Big, but with superpowers, and there are plenty of references to the Tom Hanks film which gives that lovely feeling of nostalgia. First and foremost this is a kids film but is perfectly fun for all the family, and I thoroughly enjoyed it. As with many of the comic book movies, you don’t have to have read the comic as it explains everything very well. If you have read them, you will pick up on lots of lovely Easter Eggs throughout the film. I’m looking at you Mister Mind! As well as the origin for Billy Batson becoming Shazam! we also see how the villainous Doctor Sivana came to be. Mark Strong returns to play another DC villain (he was Sinestro in the Green Lantern movie opposite Ryan Reynolds) and, as always, he does a wonderful job. He looks superb as Sivana and gets to do many evil things. He even does a perfect bad guy monologue that leads to one of the films funniest scenes. That is one of the great things about the film, it is very funny. From dealing with the whole wish fulfilment scenario of a kid getting superpowers and what they would do with them, to a recurring Santa Claus who swears too much, I found myself laughing throughout. There are quite a few surprises to be had in the film and I was glad that many characters from the comic books made it to the big screen. The whole cast is great, with Zachary Levi being the standout and bringing his inner child to the fore and doing wonderful things in the role. I hope we get to see him back as the character in sequels and other films set in the DC Cinematic Universe. The effects, as you would expect in this day and age, are fantastic. I saw the film in IMAX 3D and it looked stunning. While there were not really many standout 3D scenes, it did look incredible in the larger format and the sound mix was superb. Shazam! is a big success for the DC Cinematic Universe. If Warner Bros. embrace the comic book nature more and more then they may finally end up with something that will be a good counterpoint to the films of Marvel. If you are after a fun time at the cinema then definitely go and check out Shazam!